Citation Information: J Clin Invest. 2019. https://doi.org/10.1172/JCI121685. Chronic stress triggers activation of the sympathetic nervous system and drives malignancy. Using an immunodeficient murine system, we showed that chronic stress–induced epinephrine promoted breast cancer stem-like properties via lactate dehydrogenase A–dependent (LDHA-dependent) metabolic rewiring. Chronic stress–induced epinephrine activated LDHA to generate lactate, and the adjusted pH directed USP28-mediated deubiquitination and stabilization of MYC. The SLUG promoter was then activated by MYC, which promoted development of breast cancer stem-like traits. Using a drug screen that targeted LDHA, we found that a chronic stress–induced cancer stem-like phenotype could be reversed by vitamin C. These findings demonstrated the critical importance of psychological factors in promoting stem-like properties in breast cancer cells. Thus, the LDHA-lowering agent vitamin C can be a potential approach for combating stress-associated breast cancer. Citation Information: J Clin Invest. 2019. https://doi.org/10.1172/JCI123069. Persistent, unresolved inflammation in adipose tissue is a major contributor to obesity-associated metabolic complications. However, the molecular links between lipid-overloaded adipocytes and inflammatory immune cells in obese adipose tissues remain elusive. Here we identified adipocyte-secreted microRNA-34a (miR-34a) as a key mediator through its paracrine actions on adipose-resident macrophages. The expression of miR-34a in adipose tissues was progressively increased with the development of dietary obesity. Adipose-selective or adipocyte-specific miR-34a–KO mice were resistant to obesity-induced glucose intolerance, insulin resistance, and systemic inflammation, and this was accompanied by a significant shift in polarization of adipose-resident macrophages from proinflammatory M1 to antiinflammatory M2 phenotype. Mechanistically, mature adipocyte-secreted exosomes transported miR-34a into macrophages, thereby suppressing M2 polarization by repressing the expression of Krüppel-like factor 4 (Klf4). The suppressive effects of miR-34a on M2 polarization and its stimulation of inflammatory responses were reversed by ectopic expression of Klf4 in both bone marrow–derived macrophages and adipose depots of obese mice. Furthermore, increased miR-34a expression in visceral fat of overweight/obese subjects correlated negatively with reduced Klf4 expression, but positively with the parameters of insulin resistance and metabolic inflammation. In summary, miR-34a was a key component of adipocyte-secreted exosomal vesicles that transmitted the signal of nutrient overload to the adipose-resident macrophages for exacerbation of obesity-induced systemic inflammation and metabolic dysregulation. Citation Information: J Clin Invest. 2018. https://doi.org/10.1172/JCI120606. Peroxisomes perform essential functions in lipid metabolism, including fatty acid oxidation and plasmalogen synthesis. Here, we describe a role for peroxisomal lipid metabolism in mitochondrial dynamics in brown and beige adipocytes. Adipose tissue peroxisomal biogenesis was induced in response to cold exposure through activation of the thermogenic co-regulator PRDM16. Adipose-specific knockout of the peroxisomal biogenesis factor Pex16 (Pex16-AKO) in mice impaired cold tolerance, decreased energy expenditure, and increased diet-induced obesity. Pex16 deficiency blocked cold-induced mitochondrial fission, decreased mitochondrial copy number, and caused mitochondrial dysfunction. Adipose-specific knockout of the peroxisomal beta-oxidation enzyme acyl CoA oxidase 1 (Acox1-AKO) was not sufficient to affect adiposity, thermogenesis or mitochondrial copy number, but knockdown of the plasmalogen synthetic enzyme glyceronephosphate O-acyltransferase (GNPAT) recapitulated the effects of Pex16 inactivation on mitochondrial morphology and function. Plasmalogens are present in mitochondria and decreased with Pex16 inactivation. Their dietary supplementation increased mitochondrial copy number, improved mitochondrial function, and rescued thermogenesis in Pex16-AKO mice. These findings support a surprising interaction between peroxisomes and mitochondria to regulate mitochondrial dynamics and thermogenesis. Citation Information: J Clin Invest. 2018. https://doi.org/10.1172/JCI122595. The lipin phosphatidic acid phosphatase (PAP) enzymes are required for triacylglycerol (TAG) synthesis from glycerol 3-phosphate in most mammalian tissues. The 3 lipin proteins (lipin 1, lipin 2, and lipin 3) each have PAP activity, but have distinct tissue distributions, with lipin 1 being the predominant PAP enzyme in many metabolic tissues. One exception is the small intestine, which is unique in expressing exclusively lipin 2 and lipin 3. TAG synthesis in small intestinal enterocytes utilizes 2-monoacylglycerol and does not require the PAP reaction, making the role of lipin proteins in enterocytes unclear. Enterocyte TAGs are stored transiently as cytosolic lipid droplets or incorporated into lipoproteins (chylomicrons) for secretion. We determined that lipin enzymes are critical for chylomicron biogenesis, through regulation of membrane phospholipid composition and association of apolipoprotein B48 with nascent chylomicron particles. Lipin 2/3 deficiency caused phosphatidic acid accumulation and mammalian target of rapamycin complex 1 (mTORC1) activation, which were associated with enhanced protein levels of a key phospholipid biosynthetic enzyme (CTP:phosphocholine cytidylyltransferase α) and altered membrane phospholipid composition. Impaired chylomicron synthesis in lipin 2/3 deficiency could be rescued by normalizing phospholipid synthesis levels. These data implicate lipin 2/3 as a control point for enterocyte phospholipid homeostasis and chylomicron biogenesis. Citation Information: J Clin Invest. 2018. https://doi.org/10.1172/JCI122064. Aldehyde dehydrogenase 2 (ALDH2) is a mitochondrial enzyme detoxifying acetaldehyde and endogenous lipid aldehydes; previous studies suggest a protective role of ALDH2 against cardiovascular disease (CVD). Around 40% of East Asians carrying a single nucleotide polymorphism (SNP) ALDH2 rs671 have increased incidences of CVD. However, the role of ALDH2 in CVD beyond alcohol consumption remains poorly defined. Here we report that ALDH2/LDLR DKO mice have decreased atherosclerosis compared to LDLR KO mice, whereas ALDH2/APOpoE DKO have increased atherosclerosis, suggesting an unexpected interaction of ALDH2 with LDLR. Further studies demonstrate that in the absence of LDLR, AMPK phosphorylates ALDH2 at threonine 356 and enables its nuclear translocation. Nuclear ALDH2 interacts with HDAC3 and represses transcription of a lysosomal proton pump protein ATP6Vv0Ee2, critical for maintaining lysosomal function, autophagy and degradation of oxLDL. Interestingly, an interaction of cytosolic LDLR C-terminus with AMPK blocks ALDH2 phosphorylation and subsequent nuclear translocation, whereas ALDH2 rs671 mutant in human macrophages attenuates this interaction, which releases ALDH2 to nucleus to suppress ATP6Vv0Ee2 expression, resulting in increased foam cells due to impaired lysosomal function. Our studies reveal a novel role of ALDH2 and LDLR in atherosclerosis and provide a molecular mechanism by which ALDH2 rs671 SNP increases CVD. Citation Information: J Clin Invest. 2018. https://doi.org/10.1172/JCI98098. Notch signaling regulates differentiation of the pancreatic endocrine lineage during embryogenesis, but the role of Notch in mature β cells is unclear. We found that islets derived from lean mice show modest β cell Notch activity, which increases in obesity and in response to high glucose. This response appeared maladaptive, as mice with β cell-specific deficient Notch transcriptional activity (β-Rbpj, β-DNMAML) showed improved glucose tolerance when subjected to high-fat diet feeding. Conversely, mice with β cell-specific expression of constitutively-active Notch1 (β-NICD) had a progressive loss of β cell maturity, due to proteasomal degradation of MafA, leading to impaired glucose-stimulated insulin secretion and glucose intolerance with aging or obesity. Surprisingly, Notch-active β cells had increased proliferative capacity, leading to increased but dysfunctional β cell mass. These studies demonstrate a dynamic role for Notch in developed β cells to simultaneously regulate β cell function and proliferation. Citation Information: J Clin Invest. 2018. https://doi.org/10.1172/JCI123176. Levothyroxine (LT4) is a form of thyroid hormone used to treat hypothyroidism. In the brain, T4 is converted to the active form T3 by the type 2 deiodinase (D2). Thus, it is intriguing that carriers of the Thr92Ala polymorphism in the D2 gene (DIO2) exhibit clinical improvement when liothyronine (LT3) is added to LT4 therapy. 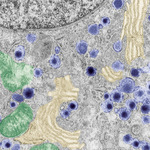 Here we report that D2 is a cargo protein in endoplasmic reticulum Golgi intermediary compartment (ERGIC) vesicles, recycling between ER and Golgi. The Thr92 to Ala substitution (Ala92-D2) caused ER stress and activated the unfolded protein response (UPR); Ala92-D2 accumulated in the trans-Golgi and generated less T3, all of which was restored by eliminating ER stress with the chemical chaperone 4-phenyl butyric acid (4-PBA). An Ala92-Dio2 polymorphism-carrying mouse exhibited UPR and hypothyroidism in distinct brain areas. The mouse refrained from physical activity, slept more and required additional time to memorize objects. Enhancing T3 signaling in the brain with LT3 improved cognition, whereas restoring proteostasis with 4-PBA eliminated the Ala92-Dio2 phenotype. In contrast, primary hypothyroidism intensified the Ala92-Dio2 phenotype, with only partial response to LT4 therapy. Disruption of cellular proteostasis and reduced Ala92-D2 activity may explain the failure of LT4 therapy in carriers of Thr92Ala-DIO2.